I was talking to my friend Karen the other day while cooking dinner and I let out a huge sigh. Karen, said “what is the matter?” I said I am out of taco seasoning. She said “you don’t make your own Homemade Taco Seasoning ?” OK seriously? Now why didn’t I think of that? Karen started laughing, she said it’s so much better and it’s way cheaper. In my home, we eat a ton of Mexican food. Whether it be Easy Taco Casserole, Dutch Oven Taco Soup or Chicken Enchiladas with Poblano Sauce we always got something cooking that we can use some extra taco seasoning in. One of my favorite reasons for making my own Homemade Taco Seasoning is, I have switched over to all organic non-GMO spices. Now I don’t have to worry about what is in those store bought mixes that I used to buy. Plus with a pouch, I only have what’s in the pouch and if I need more, then I am out of luck. I made mine and put it in a Ball Mason Jar to keep it fresh. This would also make for a great gift idea. It also allows me to see how much I have left and I can use as little or as much as I need, especially when I found out company is coming over last minute and I need to stretch the recipe that I am making for dinner. Karen was kind enough to give me her Homemade Taco Seasoning recipe and it’s very easy to make. Check out our Homemade Taco Seasoning below! 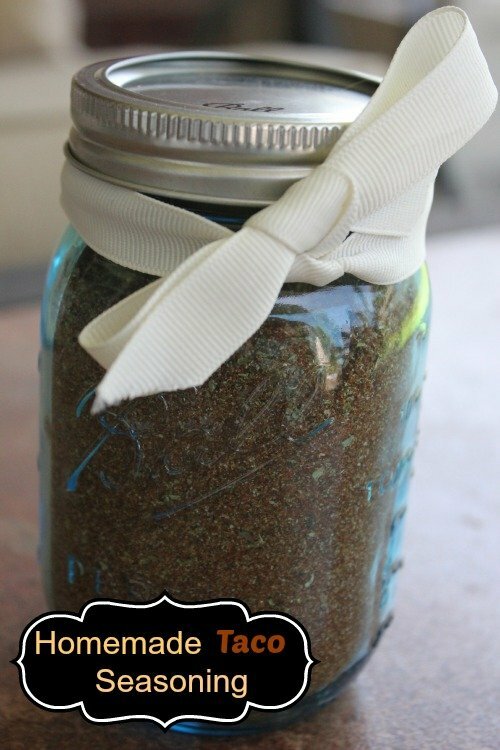 Mix Ingredients in a bowl or Mason jar. Thank you Karen for the recipe! Mix Ingrediants in a bowl or Mason jar. Discalimer: I was given some Ball Mason jars but was not asked to blog about them. I chose to do this on my own! I need a recipe for enchilada sauce. All canned versions I’ve seen have very unhealthy ingredients. Being a Tex Mex lover, I think this would save me a ton of money…and make great gifts. It would be easy enough to control the salt, too. And the heat! How do I make it comparable to mild taco seasoning? My family and I don’t do spicy tacos. Unless I have a coupon that makes it free! I always make mine homemade! Love it!